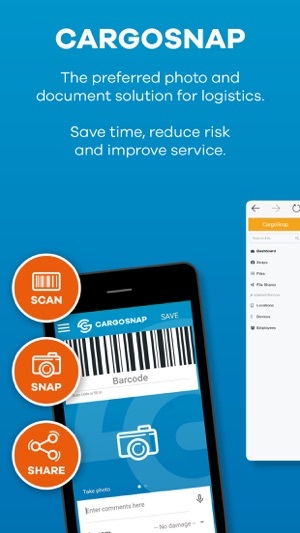 CargoSnap is a mobile app and online platform for creating, storing, and analyzing logistics photos, videos and documents. In addition, you can share this data with your relevant partners (e.g. customers or suppliers). What CargoSnap can do for you. - CargoSnap shows a wealth of information about the whereabouts and state of your products. Sharing photos of the products in different places & moments in the supply chain gives you and your client a better understanding of the current status and location of their products. This will give you and your client better insight into where in the logistics chain any problems occur. In addition, this customer-and service-oriented way of working will help you achieve a higher customer satisfaction. - Add documents as attachment, or scan them straight from the app. - CargoSnap contributes to prevention of damage to products, by providing a continuous view -and therefore grip- on the supply chain execution. - CargoSnap uses the up to date features and capabilities of smartphones (think of camera, GPS and internet access), without sharing your information on social media. Your data is securely stored on the CargoSnap servers. Only you and people that you provide access, can see your data. - CargoSnap is easy to use and does not require any specialist and/or specific knowledge of ICT or mobile technology. 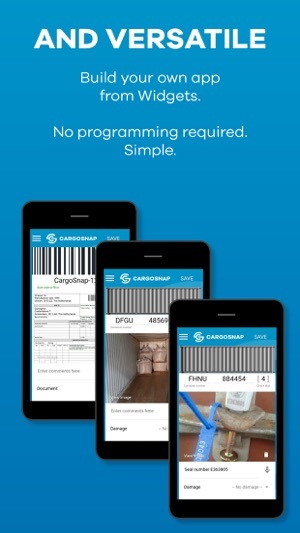 After purchasing a license, you can install the CargoSnap-app on multiple phones or tablets. After installation, you can directly start creating CargoSnaps. A CargoSnap consists of a barcode scan the product or shipment, photos of the product, indication of any damage and additional comments. The thus created CargoSnaps are then stored, with GPS location and date/time on the CargoSnap server. The CargoSnap images can subsequently be accessed, analyzed and shared via the CargoSnap platform. This update contains the "serial barcode scanner" feature and some minor bugfixes.